Last week, I wrote this post about the unfortunate experience I had at a Hyundai dealer’s service center. At the end of that post, I mentioned that I had received a tweet from Hyundai in response to my sharing the previous post with them. Ally has been exceptional in communication with me. Our phone call with friendly and pleasant, and he allowed me to air my grievances and seemed in complete agreement that my experience wasn’t as it should have been. He was also grateful for my extremely detailed blog post in which I logged all of those phone calls, Lyft rides, and the rental car. Since I deal with Noritake customer service on a regular basis, I understand the experience of responding to an unhappy customer, and when I’m the customer, I try to be as honest and fair as possible when relaying my experience. I was really irritated with the whole scenario, but read and re-read my post to make sure that everything I wrote was factual. There are certainly opinion statements in there, but nothing about the actual interactions is exaggerated. Simply having a conversation with someone from Hyundai who seemed genuine in his negative assessment of my experience was a huge step in restoring my opinion of the company as a whole. However, in following up, Hyundai were accommodating and helpful. I couldn’t be happier with the response from them. I still suffer the issue of wanting to never go back to (specifically) Paramus Hyundai again, but that’s for another day. Click here for part 2, in which I have a wonderful interaction with Hyundai’s social team. In the middle of last week, I noticed that my car was riding a bit rough, and was making what could only be called a growling sound when I was moving at higher than 40mph, and I was deeply concerned that the issue was coming from the engine or the transmission. As my car is still under warranty, I made an appointment to have the car checked out at 11:30am on Thursday, March 1, at Paramus Hyundai. Stanley calls to tell me that they don’t see an obvious issue, and that they will run a diagnostic test. The test costs $150, and if nothing is wrong, I have to pay for the test. I agree to the test. Stanley calls and asks if I’ve been in an accident. I say no, and he asks if I hit a pothole, which I definitely did (and do every year because we have snow and therefore potholes). He says that I have a broken hub bearing, and that it can be fixed that day, and will cost $771. I agree to the repair. Stanley calls again, and tells me that while they thought it wasn’t damaged, that the knuckle on the wheel with the broken hub bearing broke during the repair(he also made sure to tell me that it was probably already damaged), but that they can’t get the part until tomorrow. He says it is $300 but offers a discount of $100 off of the price, bringing my new proposed total to $971. He says that the part will be overnighted and will be delivered by 10am Friday, so my car will be ready on Friday. Luckily, an available co-worker who lives near me drives me home from the office. I have to call Paramus Hyundai because they haven’t reached out to me. I’m told that Stanley isn’t there today, but after a period of time on hold, I hear that the part hasn’t arrived yet, that the delivery might be delayed because of the weather. I’m told I will get a call when the part arrives. I call them again because I haven’t heard anything. I speak to a woman who is a service manager(I don’t get her name), and she reiterates that the weather has prevented the part from being delivered. I find this hard to believe, as my office is a few minutes away, and somehow, our deliveries have all arrived without issue, regardless of some problematic weather. She says that she’s looking into it and will call me back. I call Paramus Hyundai because the service manager from Friday never called back about the status of the part needed for my car to be fixed. I speak to another woman that I haven’t talked to before. I am asked who my contact was, and I say Stanley, and I’m told that he isn’t there. She asks my name again, and when she repeats it, the service manager from Friday chimes in to say “Oh we don’t get deliveries on the weekend. It might be here on Monday, but maybe Tuesday.” I ask if they are going to call me to tell me when the part arrives, and I get a yes. I call again, because I still haven’t heard anything. I mentioned that Stanley was my contact, and then am told “he doesn’t work here anymore,” which is slightly distressing. I’m told that my part hasn’t arrived yet. I call, again, to see if the part is there. I am finally told that it arrived and that my car will be ready tomorrow. I ask, again, if someone will call me when the car is ready, and they say yes. It’s Tuesday now and I haven’t heard anything yet. It is 12pm. I cannot believe the runaround I have been through with the service center from the dealership. I was told by so many people that Hyundai was so great, and that hasn’t been my experience at all. I have been previously irritated with this particular service center, and while I would love to not go back, I had to use a dealer service center when I thought that I might be dealing with an issue that would be warranty-covered. I probably would have taken the car somewhere else to have the wheel repaired, but when Stanley told me it would be fixed that day, I agreed, in the interest of time and the fact that my family only has 1 car, so the less time without it, the better. At this point, all of this extra time has cost me hundreds of dollars. If anyone from Paramus Hyundai had been kinder to me, or more apologetic for the delay, I would not be as upset about this, but I literally have spent over $200 on Lyft rides and a rental car. To say I am extremely disappointed would be an understatement. I only hope I get the car back today. I called the service center as I haven’t heard anything. The woman I spoke to looked something up, put me on hold, and then came back to tell me the car is ready for pickup. Yet again, wondering if anyone would have called me, as they said they would. Did the fact that my original contact guy either quit or got fired really cause all of this delay? A lovely coworker gave me a ride to Paramus Hyundai, so I didn’t have to take another Lyft. I arrived and told Vivian at the counter that I was there to pick up the car. There was some confusion about it since the paperwork wasn’t done, but it wasn’t long before I was handing my credit card over to pay the $971 for the fix. I now have 2 cars at my office, and will have to do some juggling to get Will here so that we can return the rental tonight. This has been an experience that I don’t intend to expose myself to again. 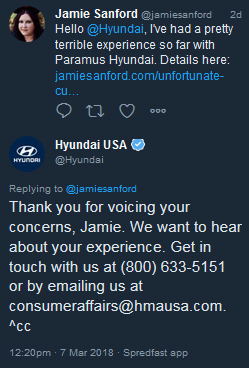 I genuinely hope that this post will be seen by Hyundai, and that it gives them a case study in how tiny changes in customer interactions would completely change someone’s experience. This Tucson is the first new car I’ve ever purchased, and I got a Hyundai because I have multiple family members with great Hyundai experiences. I haven’t experienced that as much as I wanted to, which is unfortunate. At this point in time, I can’t imagine that I will buy another Hyundai. Tell me about your favorite car brands on Twitter. Due to work schedules and juggling cars, we dropped the rental car off at Enterprise after they closed and put the key in the drop slot. As we didn’t get there before closing, we were charged for another day of rental on the final bill. The price for the rental is increased to $214.06. After tweeting out this blog post, Hyundai responds to acknowledge my issue and asks me to follow up via phone or email. I will send an email to share this blog post with them. I am grateful for the opportunity to have my voice heard here. I wanted to share a short post today about a recent email experience. I know that I just wrote about United Airlines and being irritated with their website, but I’m back with another issue. 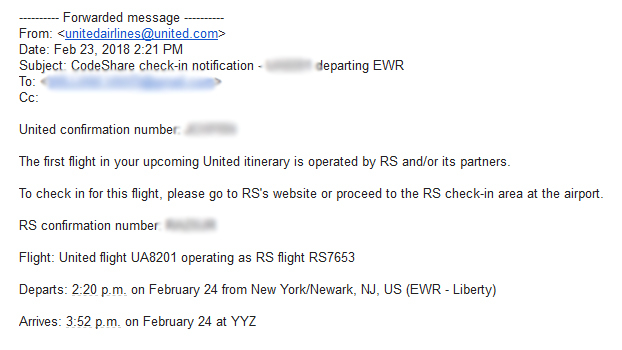 This time with an email that my husband Will received from United regarding a flight he booked with United but that was being run through a codeshare partner. OK. Let’s get into it. This email is plain text. Really? There is NO clarification on what “RS and/or its partners” is. There are no convenient links. The words “(whatever) website” should NEVER appear anywhere without being a link. This is internet 101. I can’t with this. It is 2018 and this is a MAJOR corporation, in charge of hurling people through the air across great distances. How can this be acceptable?! United, get it together. Tweet me and tell me your biggest email pet peeve. I’m back with a packaging review! 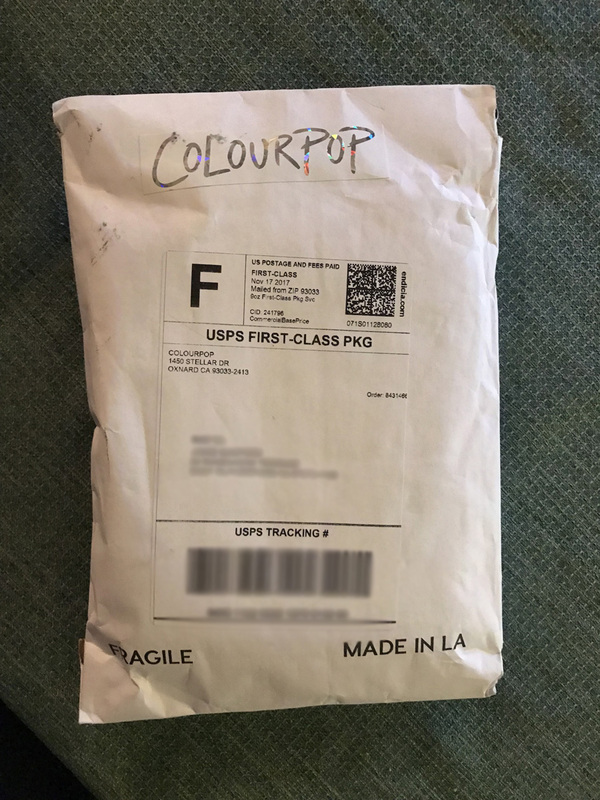 It’s been a while, but since I had never ordered from Colourpop before, it seemed like a good time to get back into these posts. 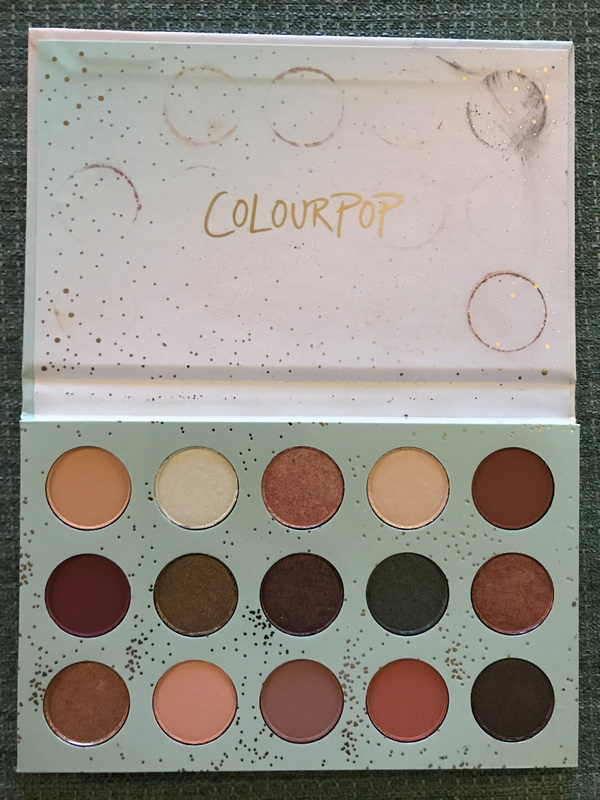 I ordered a palette when they had a sale, and it arrived within a few days. Let’s take a look. Customized with the sticker, but it doesn’t appear to be a custom envelope. Here’s a look at the back, and also at the bubble-wrapped package contents. 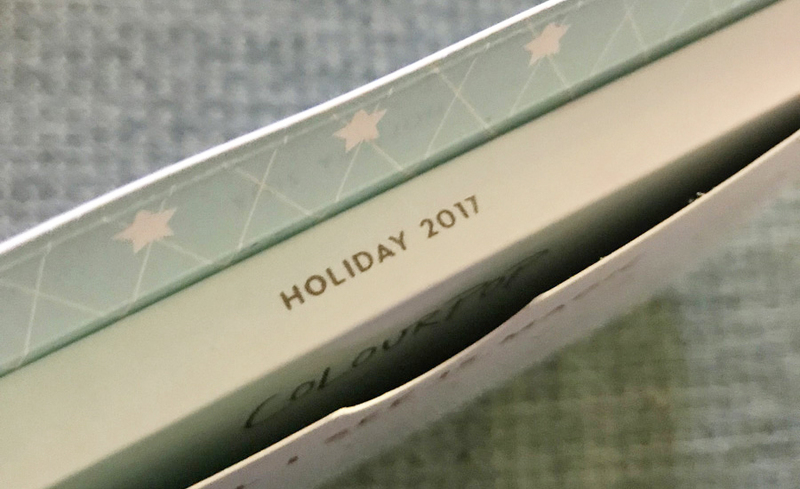 Out of the bubble wrap, we have a little Colourpop catalog/brochure, the packing list, and the palette in its outer box. Here’s the inside of the brochure and a shot of the very cute note that was also included. Spoiler alert – this is my favorite thing in this blog post. 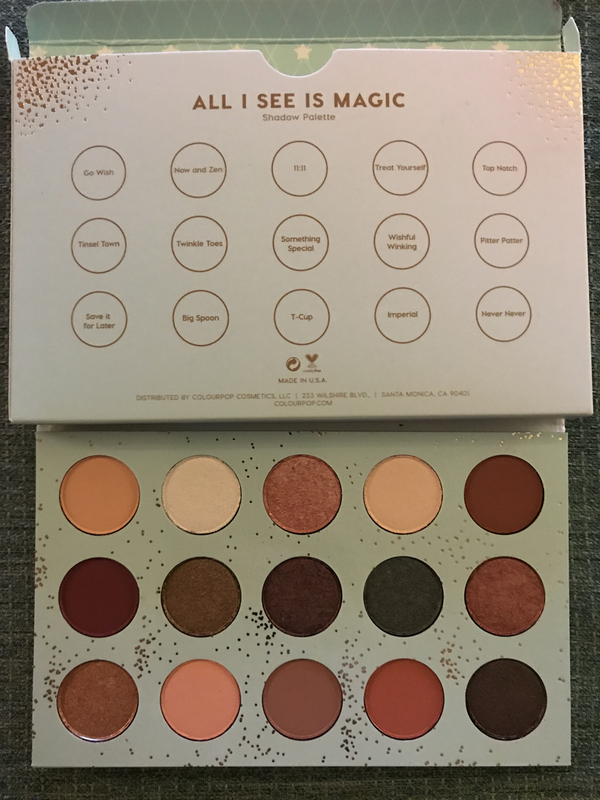 They label the palette with release dating! Every company should do this! 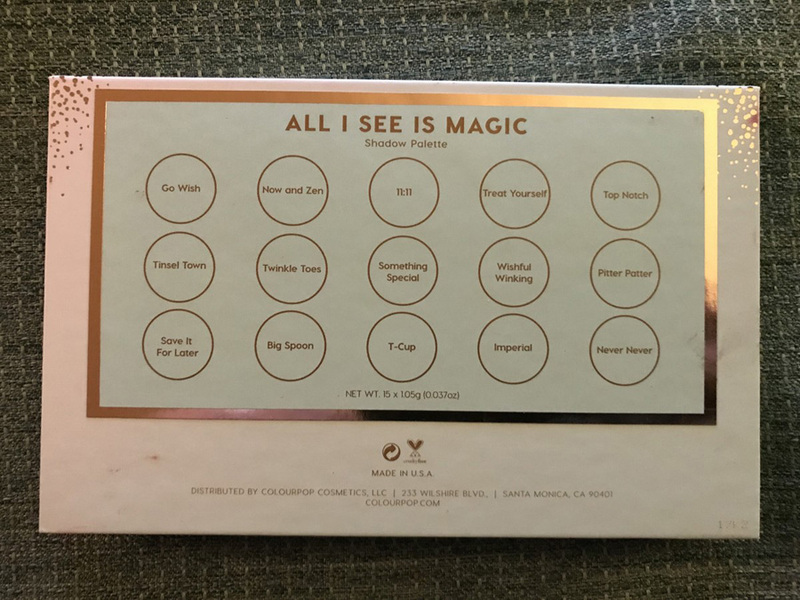 The front of the All I See is Magic palette. 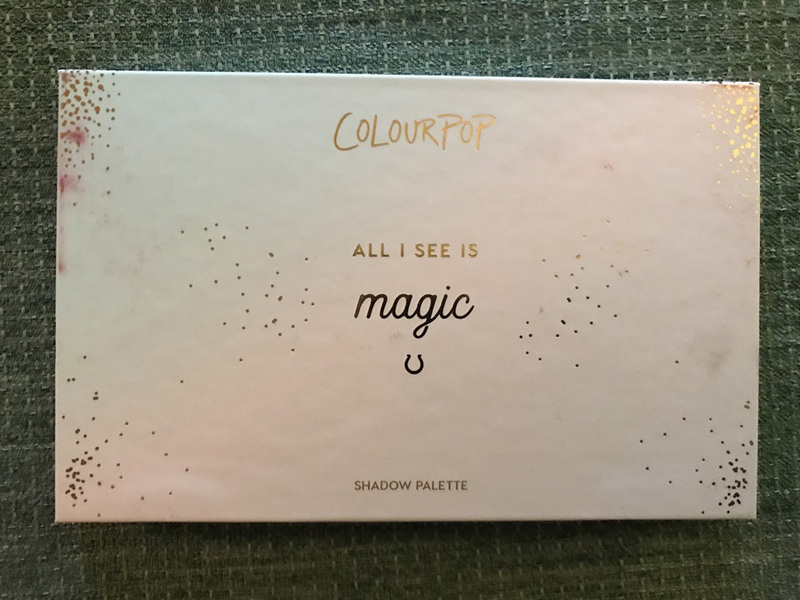 Unfortunately, you can see that some shadow has escaped the palette and smudged on the outer cover of the palette. Sadly, this is a bit worse on the inside of the palette. There are issues on some of the individual shadows as well. 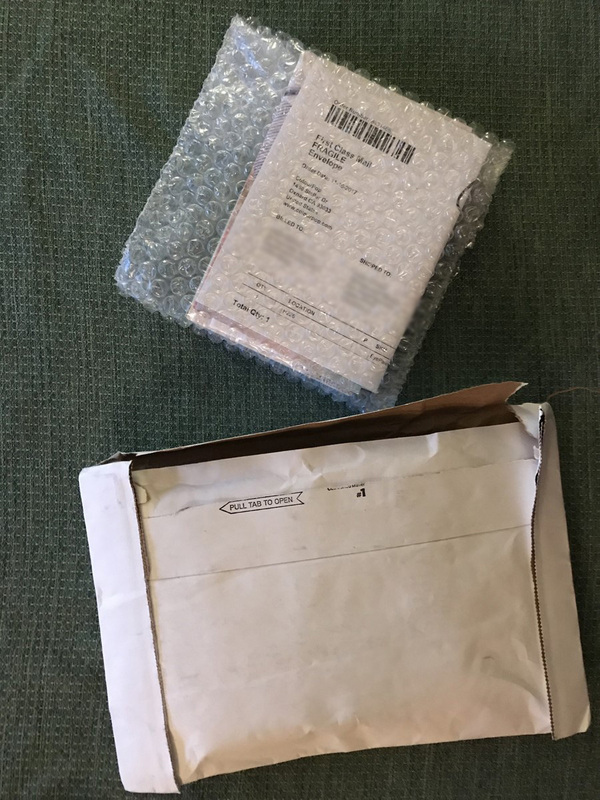 I don’t know if this is because the palette wasn’t padded enough in shipping, or if the formula of the eyeshadows is such that they are fragile and that this is to be expected, no matter the padding for shipment. The back of the palette box has the same information as on the sticker on the back of the actual palette. This all could be a little bit better. 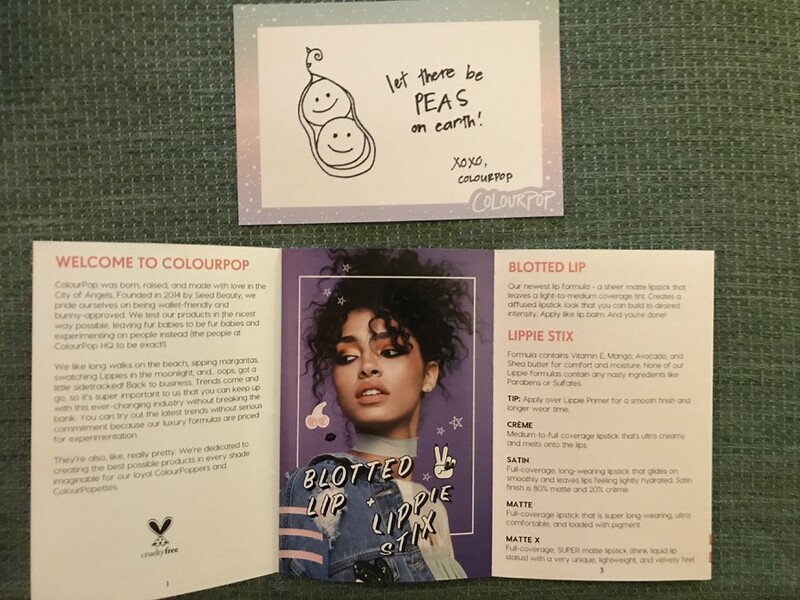 Again, I know that Colourpop is known for being budget-friendly for great quality, but I would still prefer that they identify issues like this and work it out so that the experience of their brand is just that much better. 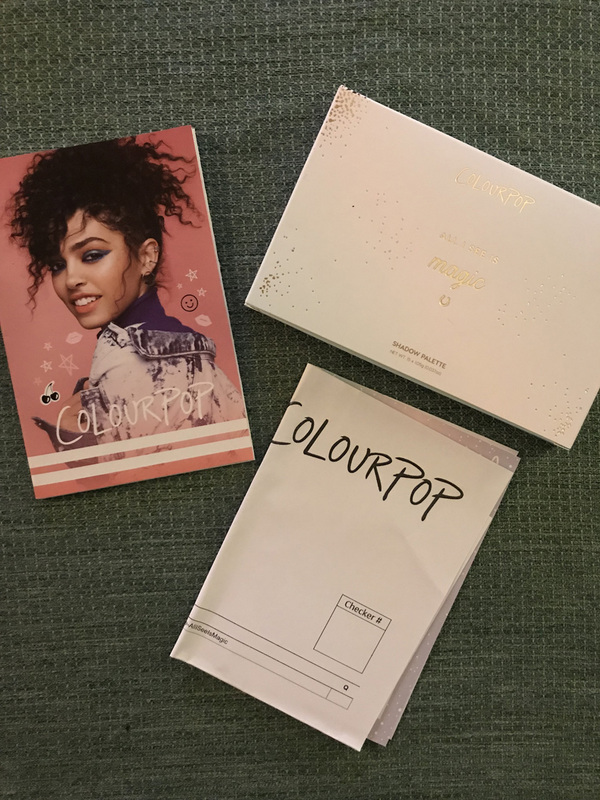 I think Colourpop is a really interesting brand, and they appear to be growing like crazy, so I’m hopeful that they can address issues like these while still being able to maintain the tenets of their brand that has brought them to their current place in the market. While I do not fly as much as I used to, I have managed to largely stay loyal to United Airlines for many years. I figured that at some point I would attempt to purchase flights with those miles so I wanted to gather them up. After having been largely unsuccessful at planning trips using miles, I started using the miles to buy meals at Newark airport. I have a good amount of miles though, so I would really like to purchase flights. 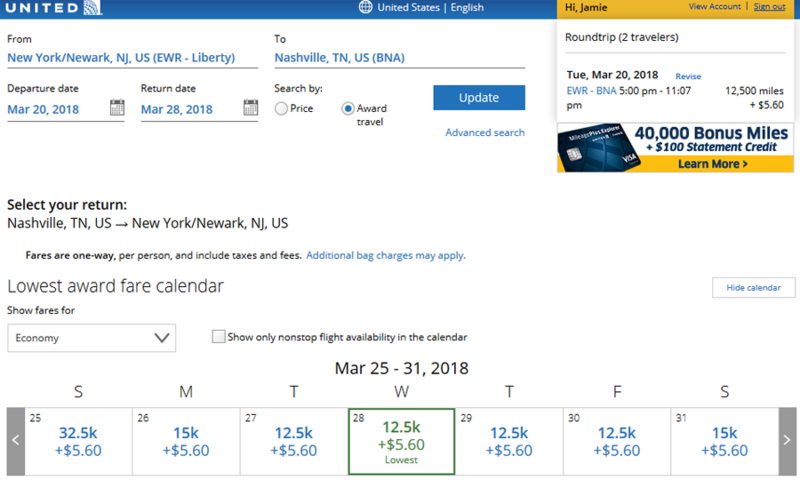 My issue is essentially this – United.com will not allow you to create one reservation with one segment paid with miles and one segment a regular flight purchase. This is what happened when I entered my preferred travel dates and told United.com to “search award travel” and then chose flights that worked for me. Why. I know from other shopping that the return flight for 2 people doesn’t cost anything near $1,264, so why would I pay for that many miles? One step earlier in the process, here’s the screen presentation after I’ve chosen one segment. I have already chosen flights that will cost 25,000 miles. 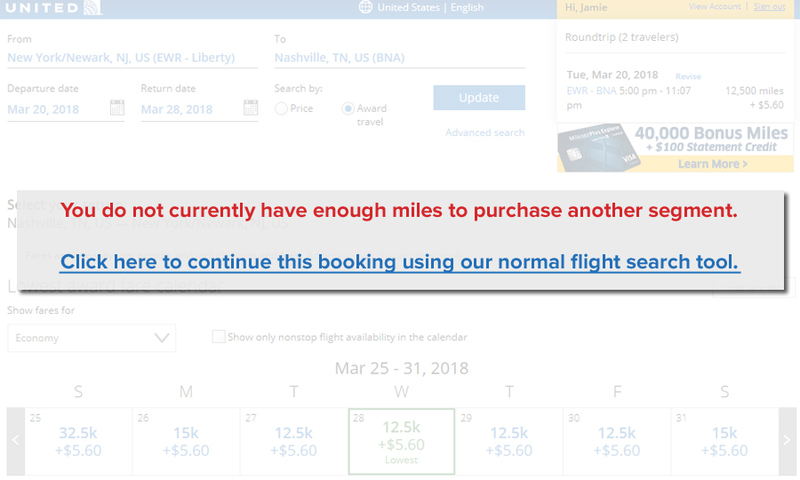 There are NO options available on all of United.com for me to spend less than an additional 25,000 miles for 2 tickets, so why am I not getting a message here, telling me that and allowing me to proceed to search for the return flights as I would normally, while not shopping for award travel? This should not be so complicated. Here it is. I have greyed out the page and created a pop-up so the situation is incredibly clear. I could be redirected to the same version of the page I see when I’m looking to purchase flights with actual dollars and not miles. Is United banking on the fact that this is frustrating and so most people will give up and just buy the flights they want? Come to think of it, I have not heard anyone tell me that any one airline is amazing at this. If you know of one, let me know! I would genuinely like to hear about it.